Blow bubbles by scuba diving and complete AquaMissions! Scuba for kids! Bubblemaker is as fun as it sounds – a chance for kids to blow bubbles by scuba diving. Children who are at least 8 years old can use scuba gear to breathe underwater and swim around in shallow water. Have a party or celebrate a birthday by throwing a memorable, exciting Bubblemaker event with friends and family at Aquaventure Dive & Photo’s indoor, heated pool. The PADI Seal Team program takes it to the next level and teaches responsibility and respect for the aquatic realm. It’s broken into two parts. AquaMissions cover basic scuba diving skills, such as breathing underwater, clearing a mask of water, recovering a regulator and swimming around experiencing the sensation of being weightless. Each session takes about an hour. Complete these AquaMissions and become a recognized Aquaventure Dive & Photo PADI Seal Team Member. Specialty AquaMissions, includes adventures like creature identification, search and recovery diving, and skin diving. Complete all of these and you’ll become a PADI Master Seal Team Member – joining an elite group of young scuba divers. Activities are limited to Aquaventure’s indoor pool and supervised by dive professionals. Participants will be very prepared when they enroll in the Junior Open Water Diver course. The PADI Junior Open Water Diver certification course. 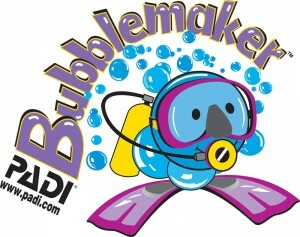 A child must be 8 years old or older to participate in Bubblemaker or the PADI Seal Team. Kids must be comfortable in the water, but no prior experience is necessary. Parental approval is required.